Set amidst the lush rolling hills of the Central Coast Allegretto Vineyard Resort offers a wine country experience unlike any other. Guests will marvel at the elegant Tuscan -style villa decor modern amenities and scenic beauty this 20 acre resort offers. 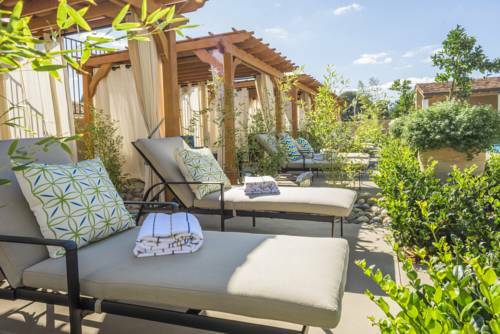 Enjoy plush rooms and suites vineyards olive orchards wine tastings both on property and within close proximity rejuvenating luxury spa culinary gardens onsite restaurant and gorgeous indoor/outdoor event space. Our Tuscan-inspired resort is just minutes from many popular wineries farm and agriculture tours olive tasting concerts in the park and so much more. All reservations require guarantee by valid credit card at time of booking. Reservations must be cancelled 72 hours prior to scheduled checkin time to avoid penalty of one nights room and tax.